Oat flour is a new addition to my pantry and I’m using it quite often these days. It’s nothing but finely powdered oats. 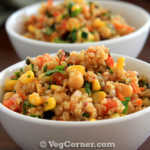 You can prepare it yourself using quick cooking oats and a food processor. I also noticed that cookies baked with oat flour are not as dense as the ones baked with whole wheat flour. I recently baked fat-free chocolate chip cookies using part all-purpose flour and part oat flour and I didn’t feel any difference at all taste-wise. Though the cookies were not the exact replica texture-wise because I had used unsweetened applesauce instead of butter. It felt more like a muffin/cake than a cookie. I’m still working to perfect a low-fat chocolate chip cookie recipe. 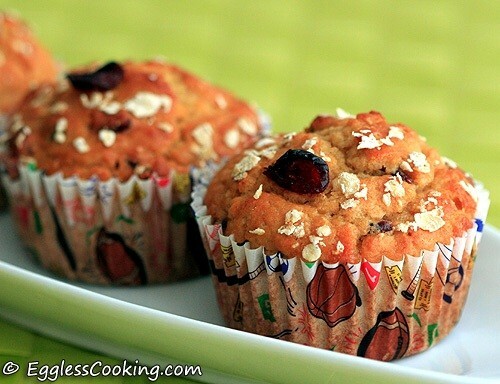 Until then here’s a recipe for cranberry muffins using oat flour. The original recipe is from Better Homes and Gardens’ Off the Shelf Baking. I have made a couple of changes to make it egg free and healthy. Preheat oven to 400F for 15 minutes. Line muffin pans with paper liners. In a medium bowl sift together the flours, salt, baking powder. Add sugar, dried fruit and the nuts. Combine well. Make a well in the center and set aside. In a liquid measuring mug measure the milk, add the yogurt, orange juice (or peel) and whisk well. Add the wet ingredients to the flour all at once and stir just until combined. Do not over mix. At this point I felt that the batter was very thick, so I added another 2 tablespoons of milk. The consistency felt right after adding the milk. Now spoon batter into prepared muffin cups, filling each two thirds full. I have a ladle which holds 3 tablespoons of batter and it’s the perfect amount to bake the perfect sized muffins. Sprinkle oats on top, if using. Bake in the preheated oven for 18-20 minutes or until golden and a wooden toothpick inserted in centers comes out clean. Mine was done by 19 minutes. Cool in muffin cups on a wire rack for 5 minutes. Remove from muffin cups; serve warm (See Taste). The tartness of the dried cranberries and the orange flavor is a winning combination. But don’t try tasting it warm if you are using whole wheat flour. The original recipe used all purpose flour but I have used a combination of whole wheat flour and oat flour, so it did not taste good when the muffins were still warm. It was a sticky and bitter mass of dough inside, which really freaked me out. Thank God I was patient enough to come to a conclusion the next day morning and was relieved that it tasted good. Actually good enough that my son had it for breakfast everyday. The original recipe used 1 and 3/4th cup of all-purpose flour. You can go with it if you are not a fan of whole wheat flour or don’t have it. Baked goods with whole wheat flour definitely don’t taste exactly like its white counterpart. Like tofu, whole wheat pasta, it’s an acquired taste. We have got used to it now. So you may want to start slowly, maybe 1 cup of all-purpose flour and 3/4th cup of whole wheat flour/oat flour. Oat flour is readily available in some of the grocery stores. 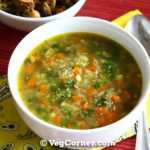 You can make it at home too by finely processing quick cooking oats in a food processor/mixer. Since oat flour does not contain gluten, it cannot substitute 100% of all purpose flour/whole wheat flour. Baked goods will not rise if it is only used. So it has to be used in combination with either all-purpose flour or whole wheat flour. I didn’t have fresh oranges to make the zest, so I went with 2 tablespoons of store bought orange juice. This does not give that fresh orange flavor, but be careful not to go overboard with the juice because sometimes the store bought juice has a bitter after-taste and it spoils the taste of the baked goods. I have used 2 tablespoons of yogurt in place of one egg white mentioned in the recipe. Even after using 2 tablespoons of orange juice I found that the batter was very thick, so I had to use another 2 tablespoons of milk. I think the whole wheat flour and the oat flour absorbed more moisture. So consider what type of flour you are using and add water as required. The original recipe is supposed to yield 12 muffins but I got only 9. 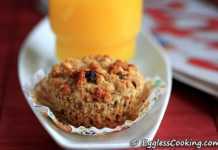 I would love to try the oat flour with the vegan cranberry orange muffins. I think that you could probably use an all-purpose gluten free flour (i.e. Pamela’s or Bob’s Red Mill) in place of the 1 cup of regular flour – and then double the baking powder to 2tsp. Thanks, Madhu. Will keep that in mind next time. 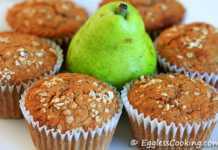 I tried this recipe today with a few variations, but the muffins did not turn out golden like yours – I used 1 cup APF(unbleached) and 3/4 cup oat flour(made at home). Instead of yogurt, I used flaxseed meal(1 tbsp mixed with 3tbsp water). What could be the reason? Your muffins look really moist, mine look a bit dry and cracked on the top. I’m yet to taste it since it is still warm. I’m guessing that you might have overcooked it. How did it taste? It tastes good, the orange flavor is really a hit like you’d mentioned. The insides are moist though (not super moist). Yes, i left the muffins a little bit past the 20 min mark hoping they’d get golden. My batter was a bit tight too(‘cos of the oat flour i think). Sometimes we try to enhance the picture, so don’t always go by that Vidya. I think adding about 2 tablespoons of liquid and baking it for a little lesser time would have worked perfectly. I tried this recipe as a snack for my toddler girl. I was disappointed with the overall results. I made a few substitutions to the recipe as i didn’t have all the ingredients on hand. 1. I used All purpose flour (1 and 3/4 cups) Instead of oat flour+AP flour. 2. 3 tbsps of veg margarine instead of oil. 3. Orange juice instead of orange peel. 6. I did not use the paper liners as i didn’t have them. The muffins baked in 17 mins. They were tasty when warm. However, after about 10 mins the muffins were hard and had a rubbery texture. I am not sure what went wrong. They were not the usual moist muffins that i usually get from your recipes. Kindly let me know what improvements i need to make for this. Can vinegar be used in this recipe instead of yogurt? Meena, I would have thought that with all purpose flour the muffins should have tasted better than mine. So I too am confused why it didn’t turn out good. 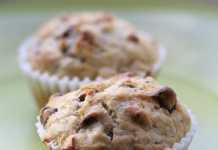 Muffins/quick breads become hard when the batter is overmixed, especially this recipe being a low fat one. The wet ingredients and dry ingredients should be just stirred. Having lumps is okay. Since you have used margarine, did you cream it with the sugar or did you just mix it. If you had done the latter maybe the batter didn’t have enough liquid. 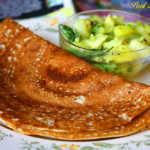 You could use a tablespoon of vinegar and increase the quantity of liquid depending upon the consistency of the batter. thanks for this recipe. i tried this yesterday. overall, i am happy with the result. but a few things i thought i’ll ask you. i had to these variations – instead of flour, i powdered whole quaker oats and used it. i used raisins instead of cranberries. i mixed baking soda and cream of tartar in 1:2 proportion to get baking powder. i used 2% milk and yogurt. i noticed 2 things. when i used paper cups for the muffins, a thick layer stuck to the paper. should i coat the paper with non-stick spray? also all the muffins had a thick outer layer which appeared to me as ‘over baked’, but inside was nicely done. do you have suggestions what i can try altering next time? SL, thanks for trying the recipe. Yes, coating the paper liner with cooking spray will make it much easier. This is more necessary in this recipe because it is a low fat muffin. Or you will have to leave the muffins for a couple of hours before peeling it from the paper. Regarding the thick crust, I would guess the temperature was a bit too high (for your oven), or you over mixed the batter. Hi,ur eggless baking recipies are gr8..I have bookmarked almost every eggless cake/muffin recipie of urs.I have some Oat bran which i want to use up..Can i powder that n use as Oat flour in this recipie..? Or do i need to buy Quick cooking oats n powder them instead..Also, in general pls let me know wats the difference between”Oat bran” and “quick cooking oats”.Can the oat bran be directly powdered and used for recipies which call for oat flour or u have to roast them and powder..? I have a lot of confusion on this and need ur guidance.I live in Denmark and i havnt seen the quick cooking oats in stores here..hence i got a big pack of oat bran.Thnks in advance. Meenal, I’m sorry that I couldn’t get back to you immediately. Oat bran and oat flour is quite different though both are products of oat. Oat flour is readily available in some stores or if you can’t find it simply powder quick cooking or rolled oats in a blender/food processor until its fine like all purpose flour. Oat bran is the outer covering of the oats. Even though I have not substituted this for oats/oat flour, I’m guessing that you won’t get the desirable texture if you substitute it. 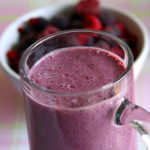 I have 2 baking recipes in my blog using oat bran, maybe you can try that to finish off the oat bran you have. You’re welcome Kalindi. It’s so wonderful to hear that the muffins turned out good. Hi, been reading your submissions of baked goods made with whole wheat. I have a problem with whole wheat baking.Anytime i bake with whole wheat the insides don’t get cooked,pls help me what am i doing wrong? Wait to hear from you. I gathered few points from various websites, maybe you can try it the next time you bake with whole wheat flour. Try adding at least 1/3rd cup of all purpose flour so that the baked good does not become very heavy and looks like uncooked. Also sift whole wheat flour a couple of times to incorporate air into the dough/batter, so that it does not become very dense. Also allow the baked goods to cool completely. (This is from personal experience, I feel that leaving it to cool overnight makes the texture more preferable). I also read that if baking completely with whole wheat flour it is advisable to increase the quantity of any liquid in the recipe a little bit or else the baked goods may become dry, but I’m thinking that is not the problem in your case. If nothing works try your luck with white whole wheat flour or whole wheat pastry flour.